Is there an easy way to add a filter option to the grid report? Currently the only option I know of to find a record in a long list is to use the ctrl+f function and tab through all the highlighted fields. It would be nice to have a filter function on all the fields similar to the sort functions and column selection function. I should have started a thread on this long ago, but i found that if you make a small change in the report-functions.php file it unlocks the filter option in Kendo-Grid API that is being used. (for the life of me I don't understand why this wasn't enabled by default.) Makes this tool very powerful! 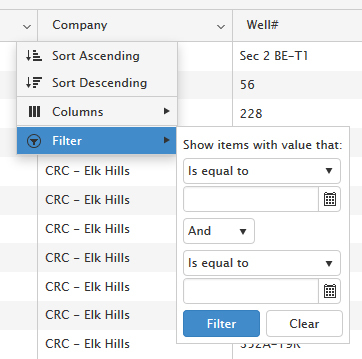 This will will add the Filter option in the drop-down see in link below. Can this block of code just be added to the report-functions.php under the report options...or is it more complicated? Oh my goodness...you are AWESOME...I have been looking for this for months. Thanks a million! This is a great find! Thanks! What other options are they hiding from us? I used to be able to drag a column to the top and it would sort my report but I can't figure out why I can't do that anymore. Anybody have a clue? Wonderful! I asked support for this feature and a search box on the report and they said it couldn't be done.